If you live in a college football hotbed, you’ve seen the fans descend on your town, their faces painted and tailgate grills burning — in fact, you might even join them. But if you’re not big on the crowds and want to make a few bucks renting while you escape for the weekend, living in a college town can give you a real home-field advantage. According to a NerdWallet study using 2016 data from vacation rental website HomeAway.com, homeowners in popular college football towns can reap serious benefits by renting out their entire homes during game day weekends. HomeAway, which launched in 2005 and owns several other industry sites, such as VRBO.com, is one of the largest facilitators of private vacation rentals. We reviewed its data for the hometowns of the final 2015 AP Top 25 football teams and observed trends for the 10 cities with sufficient data. We found that, on average, homeowners in these places could potentially cover 70% of a month’s homeownership costs by renting out their homes for just one Friday or Saturday night that month when the home team is in town. » MORE: Calculate your monthly mortgage payment. Game day weekends can be lucrative for homeowners. In the college towns we reviewed, the median nightly listing price on HomeAway for all nonevent days of the week more than doubles during game day weekends — it’s 2.37 times more, to be exact. This is an increase of $410 from the median nightly rate. Homeowners who rent could make a major dent in their mortgage. 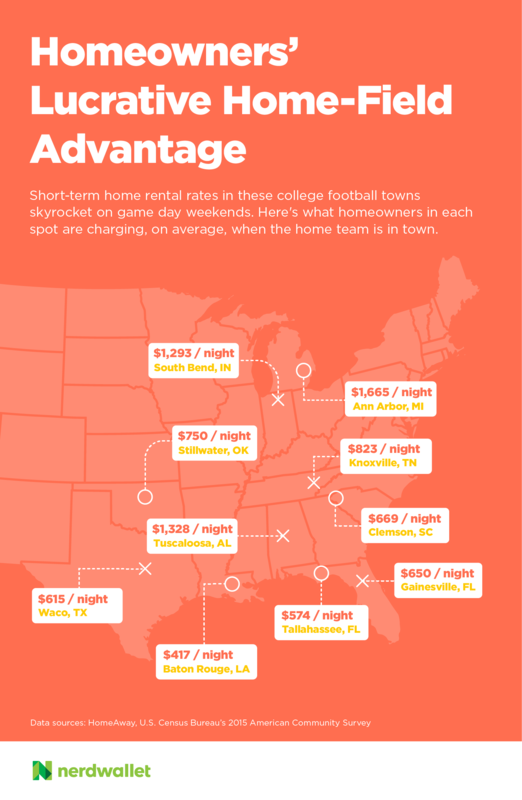 In the towns we observed, it takes renting just one night a month on a game weekend during football season to pay off 70% of monthly homeownership costs (including mortgage, utilities and taxes) on average. Homeowners in South Bend, Indiana, and Tuscaloosa, Alabama, can offset a month’s mortgage in a night. In two cities on our list, homeowners can pay off their entire month’s costs by renting for one night. Residents of South Bend, Indiana, home to the University of Notre Dame, stand to make enough to pay a whopping 144% of a month’s homeownership costs by renting for just one night during a game day weekend. Homeowners in Tuscaloosa, Alabama, home to the University of Alabama, can benefit the second most, with the potential to pay off 101% of a month’s mortgage from one night’s rental when the Crimson Tide are at home. Ann Arbor, Michigan, and Tuscaloosa experience the largest price jumps on game day weekends. In these two cities, the average nightly price on game day leaps by over $1,000 compared to all nonevent days of the week. The standard average nightly rate in Ann Arbor, Michigan, home of the University of Michigan, is $550, but it spikes to $1,665 per night when the Wolverines are in town — a difference of $1,115 per night. Tuscaloosa scores again with the second-highest price change, as average nightly rates jump from $280 to $1,328 for game weekend nights. How is it possible to make so much money by renting your home for just one night? Small- to medium-sized college towns typically have fewer hotels than big cities, and demand for this small supply is high on game day weekends. Dedicated fans who want to stay near the action are often willing to pay a premium, especially if they’re traveling in a group that requires a lot of space. Homeowners wanting to capitalize on this influx of fans can bump up their rates and reap the rewards. “Vacation rentals are a very competitive business, and the prices can be dynamic and change during times of high demand, such as a beach season, ski season or large events such as, in this case, college football weekends,” says HomeAway spokesperson Adam Annen. Keep in mind that you’ll have to pay a fee to rent your property on sites like HomeAway, typically either a flat monthly fee or a commission per booking, which will slightly reduce your profits. These fees were not factored into our analysis. There is, of course, an inherent risk in renting out your home to strangers, so make sure to secure or remove your valuables before your guests arrive. Some vacation rental sites like HomeAway offer damage waivers or other means of financial protection for homeowners who experience property damage or loss. Additionally, be aware that some cities and homeowner associations have ordinances that regulate short-term rentals. Check for rules that apply to you before you rent your home. Emily Starbuck Crone is a staff writer at NerdWallet, a personal finance website. Email: emily.crone@nerdwallet.com. Twitter: @emstarbuck. Dan Tonkovich is a data analyst at NerdWallet. Email: dtonkovich@nerdwallet.com. Franny Canine is a visual designer at NerdWallet, a personal finance website. Email: fcanine@nerdwallet.com. This analysis used 2016 rental data from HomeAway for the 25 cities that had an AP Top 25 college football team in 2015. We removed any town that had insufficient data. This included towns with too few vacation rentals to provide an accurate sample size, in addition to some large cities, like Houston, where it was not possible to attribute rate fluctuations to a single football game. To find the amount of housing costs that could be offset via rental income, we then compared the amount of money homeowners could expect to make when renting their homes out for game day with each town’s “median selected monthly owner cost (housing units with a mortgage)” from the U.S. Census Bureau’s 2015 American Community Survey.